In which Nicolas Cage plays Roy Waller, a conman (though he prefers the term 'con artist') whose obssessive compulsive tendencies are beginning to seriously affect his work. Into his neatly ordered world comes a teenage daughter (Alison Lohman), who wants to be taught the tricks of the trade... This is a film that I really loved first time out, but when I revisited it this week, I noticed quite a few plotholes which hadn't been apparent to me on first viewing. I guess I'm a little gullible, so I fell hook, line and sinker for the big 'twist' ending on my initial encounter with this movie, but going through the film a second time, a number of things just don't add up. (I should point out that there may be some major spoilers ahead, so if you haven't seen the film, you may not want to read on). It transpires that virtually every character in the movie is in on a big con, the point of which being to obtain access to Cage's security deposit box. It all seems like a ridiculously convoluted way to get hold of Cage's money - employing the services at least 5 or 6 individuals for an extended period can't have been cheap - and there was still no guarantee that Cage would provide his newly found 'daughter' with the rights of co-signatory to his account, or that he'd give his 'doctor' the secret passcode. Surely it would have made more sense for the gang to just threaten Cage with violence if he didn't give them access (though I suppose that wouldn't have made for much of a movie). Anyway, my quibbles about the plot aside, there's still quite a few things to like here - Nicolas Cage, Alison Lohman and Sam Rockwell are all great in their respective roles, and the movie is well scripted and beautifully directed by Ridley Scott. Director Lynne Ramsey returns after an extended absence with this adaptation of Lionel Shriver's bestselling novel. The 'Kevin' of the title is the perpetrator of a high school massacre, and the film gets into the head of his mother, Eva, played by Tilda Swinton. We experience a series of flashbacks from her present status as a social pariah as she looks back on Kevin's difficult childhood, trying to establish whether she was ultimately responsible for his actions. Watching this film may well be the most visceral and traumatising experience I'll have in a cinema all year - walking out of the Saturday matinee performance, I felt as though I'd been kicked in the stomach. Still, I can't deny that it's a brilliant piece of work. Tilda Swinton puts in a typically great performance, capturing her character's journey from reluctant mother to numb outcast. Ezra Miller is wonderfully malevolent as Kevin, a character who is as charismatic and articulate as he is evil. There are a number of astonishingly powerful and beautifully shot scenes, including Eva standing next to a pneumatic drill in an effort to shut out the sound of her infant son screaming, a horrifying scene tracking Eva's movements as she attempts to get home on Halloween, and the moment when Eva realises the full extent of Kevin's bloody rampage. Like Lilya 4 Ever, this is a remarkable film, but one which I am in no great hurry to go back and see again. Pod people, pod people, taste like peas, talk like people... I have to confess, I've never seen the original '50s body snatchers movie, but having thoroughly enjoyed this remake, I will have to track it down. (Though I doubt I'll bother with the recent Nicole Kidman/ Daniel Craig picture, which didn't get a great critical reception.) Anyway, this one stars Donald Sutherland as Matthew Bennell, a public health inspector in San Francisco who, together with his colleague Elizabeth Driscoll (Brooke Adams), begins to realise that something fishy is afoot in his hometown. They're right, too - an alien, plantlike species has been drifted into the local vicinity from the furthest reaches of space, and is intent on replacing the human race with mindless vegetable clones working as one to overthrow us. With the help of a disgruntled poet (Jeff Goldblum) and his wife (Veronica Cartwright), Matthew and Elizabeth hope to stop the invasion - but are they too late? This film works really well in building a palpable sense of paranoia and dread, as Sutherland et al start to realise the extent of the invasion within their city. I also liked the special effects used to show the pods gradually morphing into recognisable people - you can guarantee that if such a sequence was made in a modern Hollywood blockbuster, it would be done in CGI, and would look transparently fake - but the way it's been done in this movie makes that transformation seem horribly real. Only the ending seemed a little off to me - relying on a twist which you can see coming a mile away. Nevertheless, this is recommended viewing for fans of horror/ sci-fi fare. 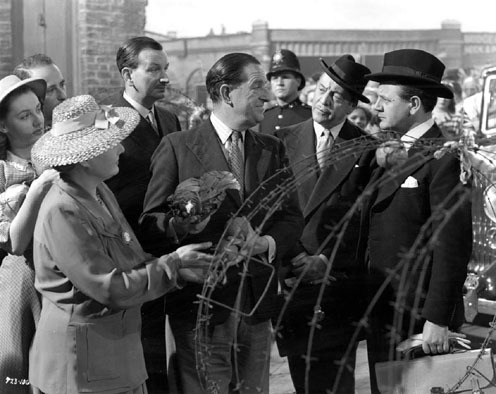 One of the classic Ealing comedies, Passport to Pimlico was made (and set) after the end of the second World War. It sees a community in the titular London borough discover that due to a royal decree which had inadvertently never been overruled, Pimlico is actually the property of the Duke of Burgundy, and not subject to the laws of England after all. On learning this, the local residents decide to exploit the situation in their favour, throwing out their ration books and disregarding pub licensing laws. However, they soon discover that living without any law and order has its downsides, and they must negotiate with the government for the right to be British subjects again. Watching this movie was like stepping back in time to the late '40s - it's very much of it's era, and some of the humour now seems rather dated. I should say that I didn't find that to be the case for those other Ealing comedies I've seen - I really enjoyed Kind Hearts & Coronets, The Ladykillers and The Man In White Suit - but I guess that the themes of those films are more universal, and less rooted in the specifics of life just after WW2. Still, there are a few laughs here and there, and it's an interesting relic of a period in history long since past.